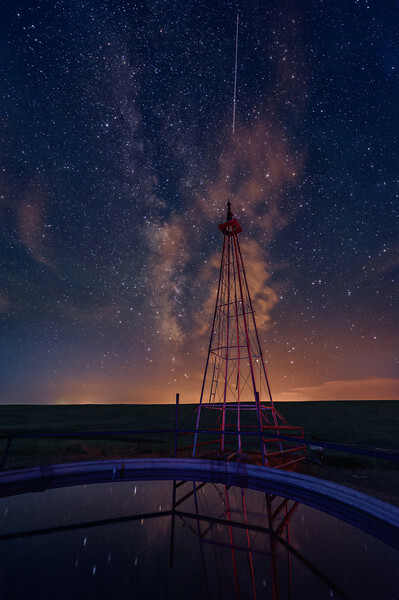 Airy clouds and a light pollution stained Milky Way dance in the night sky. The scene is pierced both both a collapsing windmill and a satellite above. Shot Notes: Light painting with blue, white and red LED flashlights (thanks to Michael Schneider ( http://www.flickr.com/photos/bitey_havalina/ ) for the loan of his blue LED!) was used to add interest to the foreground and a pre-dawn frame was used for color balance and illumination on the overall frame.